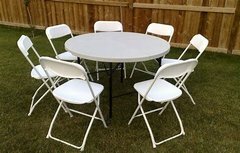 Table & Chair Rentals | MannysPartyRentals.com - South El Monte CA. If you are only renting tables and chairs your only options would be in sets of 1 table and the chairs to go with the table. (please note there is also a minimum for orders of only tables and chairs) If you need Tables, chairs and tablecloths, in any other amount they are only offered with the rentals of our Jumpers, Combos, and Canopies. Once you have placed a jumper or canopy in your shopping cart, you will then receive an add-on option for tables, chairs and table cloths.